This work was the first of three commissioned portraits of H.M. Queen Elizabeth II painted by William Dargie. The second commissioned portrait was produced for the Government of New Zealand, while the third was commissioned in 1975 for the Portrait Gallery of Sir Leon and Lady Trout. 'Four sittings which turned out to be seven - of two hours each. I was absolutely terrified at first. 'She was very amusing, she was marvellous. At the time we were all for the Queen. I guess I was a bit apprehensive at first, but she soon put me at my ease. She made it easy for me. 'She was a very good subject. We talked on a range of subjects, but we didn't touch on anything controversial. James Beveridge had also been a fellow member with Dargie of the Melbourne Savage Club. The work when completed was presented to the Commonwealth Government, and today the portrait is on permanent display in Parliament House, Canberra. 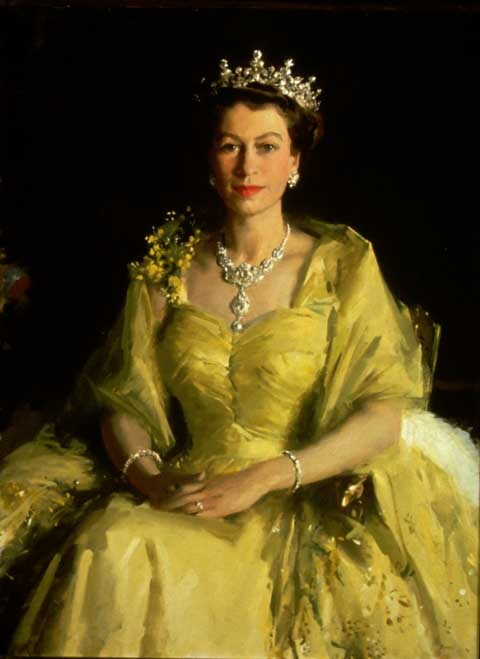 The 'Wattle Painting', as some critics referred to it, was well received by the public and the Government, and became the official portrait for Australia of H.M. Queen Elizabeth II. The reason for the 'wattle' tag was quite obvious, with the gown described as, 'Harnett crinoline of mimosa gold tulle, its skirt sparkling with wattle motifs in gold paillettes.' The tiara that the Queen wore had been a present from her grandmother, Queen Mary, when she died, and the matching necklace of diamond flowers and leaves was part of a wedding present from Nizam of Hyderabad. The Queen, who had arrived in Sydney on 3 February 1954, had worn this 'wattle' gown to her first evening engagement in Sydney, and again to her last evening function in Perth. Within a very short time of Dargie completing the portrait, colour prints of the work were made available and began to appear in Federal, State and Local Government Departments, and many schools, hospitals, libraries, church halls and RSL clubrooms throughout Australia. Coloured prints are still advertised, as available today, through The Monarchist League in Australia. For many 'new arrivals' to Australia, this work was their first encounter with an artwork by an Australian artist, as the work was reproduced on their Australian naturalization papers, and a print of the work was generally present in the local Town Hall where their naturalization ceremony usually took place. In 1976, Dargie designed a commemorative plate '9 inches in diameter' portraying 'the Queen in her 50th year and the Queen Mother in her 75th' for the Archive College of Australia. As well as H.M. Queen Elizabeth II, Dargie has painted a number of portraits of other members of the Royal Family. These include the portrait of H.R.H. The Duke of Edinburgh painted in 1956, and the portraits of H.R.H. The Duke of Gloucester, Princess Alexandra and her mother, and also the Princess Royal. No works can be copied from this site. Permission to publish or reproduce can be sought from the Parliament House Art Collection. All Rights Reserved medialaunch Pty. Ltd.